Located 15 miles across the Guanabara Bay from Rio de Janeiro’s historic downtown, the city of São Gonçalo has followed a much different path than its famous neighbor. Throughout the 20th century, São Gonçalo experienced a steady decrease in economic prosperity and household income, reflected in a 2012 report that had over 51% of the population living below the poverty line. The drug trade and its factions have a significant presence. While Rio’s international stature and potential for economic growth are highlighted through hosting even problematic mega-events like the 2014 World Cup and the 2016 Olympic Games, São Gonçalo has seen and will continue to see little benefit coming from the popularity of its neighbor. In fact, one of the only changes this city’s inhabitants have seen thus far is a mass influx of paramilitary drug traffickers, fleeing Rio’s favelas (unincorporated urban settlements) as a result of aggressive police tactics to forcibly remove them from the municipality of Rio de Janeiro before the Cup. The workers, many of whom have lived their entire lives without access to potable water, permanent electricity, or any public health services, make their homes here. One of the areas most affected by this influx of traffickers is the Complexo do Salgueiro favela located north of downtown São Gonçalo. The community in the following photo essay, the Fazenda dos Mineiros (one of six in the Salgueiro), boasts a population of about 3,000 residents and has largely developed outside of municipal, city, and state infrastructures. Constructed alongside one of the two largest municipal dumps in the state, Fazenda dos Mineiros has been the home and workplace for thousands of “lixeiros”, or trash workers (Lima, 2009) living in conditions much like those in the 2010 documentary “Wasteland.” The workers, many of whom have lived their entire lives without access to potable water, permanent electricity, or any public health services, make their homes here. Despite years of neglect and recent gang incursions, the neighborhood has become a dwelling place for over three generations of inhabitants. This community and its abandonment provide a stark contrast to the money and excitement that accompany the mega events. We decided to cover this community because it is a striking example of a long history of social neglect, and demonstrates the consequences of the social mandates enacted in preparation for the World Cup and Olympic games beyond the major host cities. This community and its abandonment provide a stark contrast to the money and excitement that accompany the mega events. 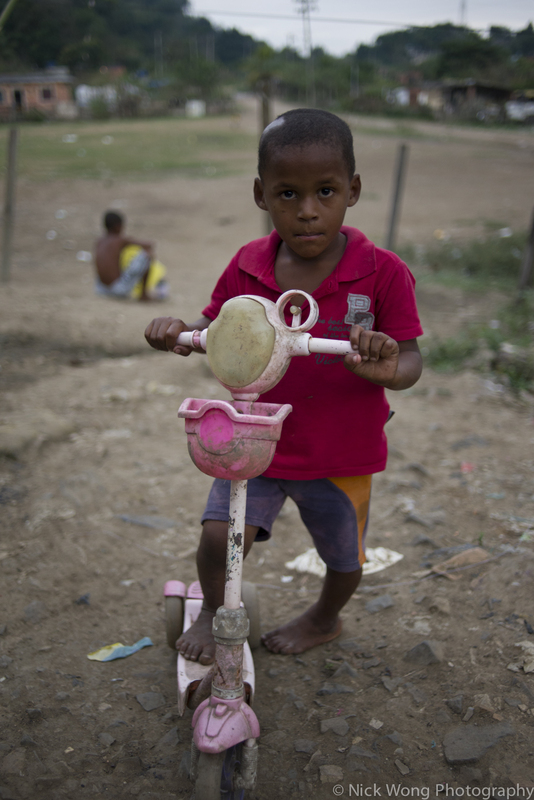 Nonetheless, the conditions in Fazenda dos Mineiros and their consequences in people’s lives can be seen in neighborhoods throughout Rio de Janeiro and nearby cities. As Brazil attempts to move forward on the global stage, Fazenda dos Mineiros is a place that has been left behind, and this essay is an attempt to draw attention to and thereby change that. The following series of photos seeks to explore how individuals in this community go through their lives in this precarious yet vibrant community. Click on any photo to enter slide show. * Some names in these photographs have been changed. Nick Wong graduated with degrees in Sociology and American Ethnic Studies from the University of Washington. A Mary Gates Scholar, Jack Straw Writer, Bonderman Fellow and Fulbright scholar, he has spent the last decade exploring culture through the art of prizefighting. He is now volunteering with Fight for Peace – a non-profit that uses the sport of boxing to deter youth from entering the drug trade in Rio de Janeiro. Please visit his work here: www.wanderingpugilist.com. Stuart Davis is a PhD Candidate in the Department of Radio-TV-Film at the University of Texas-Austin and former visiting professor of Southern Oregon University. His specializations include communication and social justice, Brazilian media cultures, citizen journalism, and international communication systems. In 2012, he received a Fulbright Fellowship to study at the Federal University of Rio de Janeiro, researching the role of international news and media exposure in facilitating community development programs in the favelas of Rio de Janeiro. Abreu, M (1987). Evolução urbana do Rio de Janeiro. Rio de Janeiro, RJ: J. Zahar Editora. Alvito, M and Zalaur A (2009). Um século de favela: segunda edição. Rio de Janeiro, RJ: Fundação Getulio Vargas.